The following article appeared in the June 1978 issue of Gallery magazine, and is reprinted here with permission of Mr. Sprague. The possibility that a very rare and special secret weapon system, developed by the CIA at Fort Detrick, Maryland, was used to immobilize JFK, and thus ensure the success of "the turkey shoot" carried out in Dealey Plaza is explored in great detail below. To arrive at a solution to a murder as enigmatic and convoluted as that of JFK, we must confront the existence of the netherworld of secret operations carried out by covert agencies within our own government: "We have to start thinking like the CIA, people. . . . Black is white, and white is black." November 22, 1963, the day President Kennedy was slain, was bright and sunny in Dallas. Why, then, was there a young man with an open umbrella on Elm Street, less than 30 feet from the President's car as it slowly passed by? Presented below is an answer to this puzzle by a former consultant to the House Select Committee on Assassinations. To the skeptic who refuses to accept the idea that the Central Intelligence Agency was involved in the assassination of John Kennedy, nothing could be more convincing than to demonstrate how one of the CIA's secret poison and weapon systems was used in the assassination. Such a claim would have been scoffed at by everyone, but the weapons system itself was made public by Mr. William Colby, CIA director; Mr. Richard Helms, former CIA director; and Mr. Charles Senseney, a contract weapons designer for the CIA in testimony before the Senate Select Committee on Intelligence (the Church Committee) in September 1975. The system is based on launching devices of various types, used to launch a self-propelled, rocket-like dart, or flechette. The flechette can carry either a paralyzing or fatal poison. The flechette itself is very simple. It is about the same size and looks like the tip of a large chicken feather. It is plastic and has tiny tail fins. Many varieties were developed for different uses. The great advantage of this weapon is that it is recoilless, almost silent, and the flechette travels at a high velocity which increases after launch. The flechettes can be fired singly or in high-impact clusters. It is propelled to its target by a solid-state fuel, ignited electronically at the launcher. It strikes its target, animal or human, dissolves completely in the body leaving no observable trace, and totally paralyzes its victim within two seconds. The launching devices developed by Mr. Charles Senseney at Fort Detrick, Maryland for the CIA included a cane, a fountain pen, soda straws, and an umbrella. The umbrella was used to shoot President Kennedy. The flechette struck JFK in the throat, causing a small entrance wound, but leaving no other trace. The missile was about 5 millimeters in diameter, and the wound was 4 millimeters. The size of the wound as compared to the size of the flechette is consistent with other findings of this nature. This particular wound, officially called an exit wound by the Warren Commission, puzzled medical examiners and critics of the Warren Commission alike. The critics charged that had the throat wound been an exit wound, it could not have been so small. JFK was paralyzed by poison contained in the flechette in less than two seconds--so paralyzed that the first rifle bullet that hit him did not knock him down, but left him in a nearly upright position. A second volley of shots fired at JFK a few seconds later struck a stationary, visible target. The paralyzing flechette shot was fired by a man holding the umbrella launcher. He was in close proximity to an accomplice. Using a radio transmitter, the accomplice signaled the riflemen through each of their respective radiomen in the Dal Tex building, the western end of the Texas School Book Depository building, and on the grassy knoll. An exquisitely timed intelligence murder was performed. The paralytic poison allowed two volleys of rifle shots to be fired into JFK. He had become a sitting duck. In what follows, the basic evidence for this sophisticated murder technique and weapon system will be presented. Much of the evidence, in the form of photographs, has been under the noses of assassination researchers for many years. The testimony given by Colby, Helms, and Senseney opened the minds of a small group of researchers, who looked at the photographic, medical, and ballistics evidence in a new way. The coauthors of this article and researcher Christopher Sharrett have now been able to clearly show that JFK's assassination had to have been a carefully planned, well-executed intelligence operation, using CIA weapons and techniques. Numbers beginning with "Z" are frames of the Zapruder film. Crucial to an understanding of the shots and JFK's reactions to them is an understanding of President Kennedy's hand, head, and upper torso movements at the time he was hit by shots, and the motions of Governor Connally. Contrary to what most media organizations and some researchers state, JFK's hands did not raise to grasp at his throat. The Zapruder film shows quite clearly that just the opposite occurred. Photos #1 through 6, are frames 189, 190, 204, 224, 225, and 227 from the Zapruder film. The President's right hand can be seen making what appears at first to be a slight forward jerk between frames 189 and 190 (1/18 second) and then snapping downward from his forehead to a position well below his throat by frames Z224 and Z225. It also clenches into a fist. His head, during this two-second timespan, snaps into a nearly straight-ahead position, and his left hand raises and clenches into a fist somewhat below his right hand level. His right fist can be seen to be still moving downward between frames Z224 and Z225. The discontinuity between Z189 and Z190 added to the continuous downward, fist-clenching motion of his right hand from Z190 to Z225 has been taken by many researchers as evidence of a shot striking JFK at frame Z189. The theory of discontinuous motion caused by a transfer of momentum from an externally applied force is evident here. Any discontinuity in JFK's motions occurring in the 1/18 second between frames can be taken as evidence of momentum transfer from a projectile, rather than being caused by any internal neurological phenomenon, voluntary or involuntary. What actually occurs between Z189 and Z190 is a backward and upward motion of JFK's head. His right hand remains in a fixed position with respect to the side of the limousine. This indicates a shot from the front. A second such discontinuity occurs between frames Z225 and Z227 (2/18 second), during which time JFK's head and upper torso are driven forward and down into his clenched fists. The fists remain in a fixed position with respect to the side of the limousine. JFK's elbows are flung upward and outward by the force of a rifle bullet striking him in the back. This is the shot that caused the back wound 5 3/4 inches down from the top of his shirt and created holes in his jacket, his shirt, and his back. It did not exit at his throat. A similar analysis of momentum transfer from the rear causing a discontinuity in motion can be made for Governor Connally between frames Z237 and Z238 (photos #7 and 8). Finally, JFK's head motions between frames Z312, Z313, Z314, and Z321 (shown in photos 9 through 12) demonstrate two transfers of momentum--one from the rear, between Z312 and Z313, and another from the right front, between Z313 and Z314 and up to Z321. The latter bullet drove JFK's head and upper torso back and to his left, where he bounced off the rear seat into his wife's arms. Throughout the last fourteen years, a number of questions arising from the evidence obtained at Dealey Plaza have puzzled serious researchers. While these questions seem to be unrelated, all of them are answered in a very logical way by this new interpretation of the evidence. Assuming the throat wound in JFK to be an entry wound, why was it so small (4mm)? How could a rifle bullet leave such a small wound (about the size of a soda straw)? If a bullet did enter JFK's throat, where did it go? Why was no trace of a bullet found? The entry wound apparently was not at a downward angle. If a bullet was fired from the grassy knoll, hitting JFK in the throat at Z189 (frame 189 of the film shot by Abraham Zapruder), where could it have come from to enter at a nearly horizontal trajectory, while missing everything in its path, including the Stemmons Freeway sign, Abraham Zapruder, a small tree, the side of the limousine, Secret Service agent Kellerman, Governor Connally, and the limousine windshield? Where did the throat shot come from? Why is there a forward motion of JFK's right hand between Z189 and Z190, if a shot hit him from the front at that time? Why didn't that bullet drive JFK violently backward (see photos #1 and 2)? Why did the President's hands clench into fists and drop below his throat as the result of a bullet striking him in the throat? Why did his head snap around to the front? These motions, which can be observed in photos #1 to 6, Zapruder frames 189, 190, 204, 224, 225, and 227, appear to be more like a stiffening action, taking a little less than two seconds, rather than the grasping at his throat described by many casual observers. JFK did not grasp at his throat at all. Why didn't the bullet fired at frame Z225, striking JFK in the back, knock him down on the seat? Why are JFK's fists still in the same position after the bullet hits, Z225 to Z227 (see photo #6, 2/18 second after photo #5)? The motions make it appear that JFK's head, torso, and fists were frozen in position at Z225. The bullet forced his head and upper torso down and forward into his fists. It flung his elbows outward as though they were pivoting around his fists and shoulders. Why? Why didn't JFK duck or turn or shout after he was hit at Z189? His mouth opened, but there is obviously no lip or mouth motion between Z224 and the time of the fatal shots. When Governor John Connally was hit, he screamed "like a stuck pig," said Jackie Kennedy, and rolled to the floor of the car. One bullet went completely through Connally, and he is alive today. If JFK had been able to fall to the floor after the first, nonlethal bullet hit him in the back, he might have lived, too. But he could not, because the flechette's poison had paralyzed him. The people who thought they heard JFK scream were imagining it. Some witnesses said they heard two volleys of shots separated by a few seconds. The photographic evidence coupled with other evidence shows there actually were two volleys of shots: The first volley was timed between Z189, when the throat shot hit, and Z237, when a shot hit Connally. The back shot hit JFK at Z225. The shots in this volley occurred over forty-eight frames, or about two and a half seconds. If the Z189 shot is taken out, the other two shots were separated by only twelve frames, or about a half- second. The earliest overseas press reports, such as NZPA-AAP (New Zealand Press Association) datelined Dallas, said, "Three bursts of gunfire, apparently from automatic weapons, were heard." These earliest reports had not been tampered with. The second volley occurred at frames Z312 and Z313, nearly simultaneously. The shot that missed could have also been fired at about this same time (see photos #9 and 10). Were there two volleys of shots, and if so, why? How could shots fired from three or four widely separated positions be timed so accurately? Keep in mind that the earliest reports said "automatic weapons." On-the-spot witnesses heard shots so closely timed that they reported them to be from automatic weapons. This takes precision firing under control. The authors disagree on the timing of the Connally shot. Cutler believes it was fired at Z223, Sprague at Z237, a difference of less than a second. In either case, it was part of the first volley and was a separate shot from the JFK back shot at Z225. Questions have always been raised about TUM (The Umbrella Man) ever since Josiah Thompson and Richard Sprague discovered the open umbrella in a series of photographs. Photo #13, a picture taken by Phil Willis at Zapruder frame 202, shows TUM with open umbrella. Photos #4, 5, and 6 (frames 224, 225, and 227 of Zapruder's film) show the umbrella protruding from behind the Stemmons Freeway sign. Photo #14 (by Richard Bothun) shows TUM less than a minute after the shots, sitting on the edge of the grass near his original position, with another man seated next to him. The umbrella is lying on the sidewalk. Photos #15 and 16 (by Wilma Bond) show TUM a minute later, standing near the highway sign holding the umbrella. The temperature was a cool and breezy 68 degrees F. The sky was clear blue. No rain had fallen since early that morning. No natural reason seemed to exist for a fairly young man to be holding an open umbrella over his head while the President of the United States was passing by, ten to fifteen feet away (see diagram of relative positions of TUM and JFK). An examination of the thousands of photographs taken during the Presidential procession and in and around Dealey Plaza that day revealed not a single other open umbrella. Thompson and Sprague's speculations were that TUM was giving visual signals--first to go ahead (opening umbrella), then to fire a second round (raising umbrella). Afterward, the speculation went, he stayed around to see whether anyone had noticed anything about the actual shooters. A closer analysis of the Zapruder film shows that TUM actually raised and lowered the umbrella very rapidly--too rapidly to have been a good signal for riflemen as far away as the Dal Tex building and the grassy knoll (see photos #3, 4, 5, 6, 17). Why did he do this? Analysis also shows that TUM actually rotated the umbrella. This rotation appears in the original Zapruder film, including frames up to Z236 that show the umbrella in the space between the sprocket holes. Measurements of this rotation show that it tracks JFK's position during his travel down Elm Street at this time period. Why did TUM rotate the umbrella? If he were an observer, he would turn his head, not the umbrella. After the shooting, why did TUM sit down and then stand up, within a few feet of his position in front of the Stemmons Freeway sign, when everyone else in that vicinity ran or jumped away in the direction of the grassy knoll? Everyone, that is, except one man who sat down next to TUM. Who was he, and where was he when the shots were fired, and what was he doing with TUM? No natural reason seemed to exist for a fairly young man to be holding an open umbrella over his head while the President was passing by ten or fifteen feet away. Colonel L. Fletcher Prouty of the Defense Department witnessed a demonstration of the flechette-launching weapon system in his office in Washington, D.C. in 1960. Here is his description. It was in my own office, in a part of the Office of the Secretary of Defense, in the Pentagon in 1960 that I first saw an early version of the weapon fired. On July 29, 1960 I flew to Fort Detrick, Maryland by helicopter from the Pentagon to see developments of this and other new weapons at that top secret installation. I am able from personal and official experience to support the Sprague- Cutler thesis that an umbrella weapon was used as part of the JFK murder plot. The answers to all of these questions and the analysis of the evidence must begin historically with the development of the weapon system itself. There is no better way to describe it than to hear about it from ex-CIA directors William Colby and Richard Helms and weapon developer Charles Senseney. Here is their testimony before the Church Committee on September 16 to 18, 1975, as published in Volume One (1976) of that Committee's final report, under the title, "Unauthorized Storage of Toxic Agents." TUESDAY, SEPTEMBER 16, 1975. Testimony of William E. Colby, director of the Central Intelligence Agency. The Committee met at 10 A.M. in the Russell Building. Present: Senators Church, Tower, Mondale, Huddleston, Morgan, Hart of Colorado Baker, Goldwater, Mathias, and Schweiker. Also present: William G. Miller, staff director, Frederick A. 0. Schwarz, chief counsel, Curtis Smothers and Paul Michel, Committee staff members. Chairman Church: The particular case under examination today involves the illegal possession of deadly biological poisons which were retained within the CIA for five years after their destruction was ordered by the President. . . . The main questions before the Committee are why the poisons were developed in such quantities in the first place: why the Presidential order was disobeyed; and why such a serious act of insubordination could remain undetected for so many years. William Colby: The specific subject today concerns the CIA's involvement in the development of bacteriological warfare materials with the Army's Biological Laboratory at Fort Detrick, CIA's retention of an amount of shellfish toxin, and CIA's use and investigation of various chemicals and drugs. . . . Information provided by him [a CIA officer not directly associated with the project] and by two other officers aware of the project indicated that the project at Fort Detrick involved the development of bacteriological warfare agents--some lethal--and associated delivery systems suitable for clandestine use [emphasis added]. The CIA relationship with the Special Operations Division at Fort Detrick was formally established in May 1952. The need for such capabilities was tied to earlier Office of Strategic Services World War II experience, which included the development of two different types of agent suicide pills to be used in the event of capture and a successful operation using biological warfare materials to incapacitate a Nazi leader temporarily. One such operation involved the penetration of a facility abroad for intelligence collection. The compound was guarded by watchdogs which made entry difficult even when it was empty. Darts were delivered for the operation, but were not used. Church: Have you brought with you some of those devices which would have enabled the CIA to use this poison for killing people? Church: Does this pistol fire the dart? Church: So that when it fires, it fires silently? Senator Church with flechette launcher later modified for umbrella. Senator Tower at right. Church: What range does it have? Colby: One hundred meters, I believe; about 100 yards, 100 meters. Church: About 100 meters range? Huddleston: Mr. Helms, you said you were surprised, or that you had never seen the dart gun that was displayed here yesterday. Would you be surprised or shocked to learn that that gun, or one like it, had been used by agents against either watchdogs or human beings? Helms: I would be surprised if it had been used against human beings, but I'm not surprised it would have been used against watchdogs. I believe there were various experiments conducted in an effort to find out how one could either tranquilize or kill guard dogs in foreign countries. That does not surprise me at all. Huddleston: Do you know whether or not it was used, in fact, against watchdogs? Helms: I believe there were experiments conducted against dogs. Whether it was ever used in a live operational situation against dogs, I do not recall. Senseney: I worked in the Biological Warfare Section of Fort Detrick from 1953. . . . I was the project engineer of the M-1 dart launcher and following on microorganism projectiles and so forth. Smothers: Is this a device that looks roughly like a .45 caliber pistol with a sight mount at the top? Senseney: This was a follow-on. It was to replace the M-1 projectile to go into the Army stockpile. It did look like a .45. Smothers: Did the CIA have, Mr. Senseney, the wherewithal to utilize this dart launcher against humans? Senseney: No, they asked for a modification to use against a dog. Now, these were actually given to them, and they were actually expended, because we got all of the hardware back. For a dog, the projectile had to be made many times bigger. It was almost the size of a .22 cartridge, but it carried a chemical compound known as 46-40. Smothers: And their interest was in dog incapacitation? Baker: Your principle job with the DOD, I take it, was to develop new or exotic devices and weapons: is that correct? Senseney: I was a project engineer for the E-1, which was type classified and became the M-1. They were done for the Army. Baker: Did you have any other customers? Senseney: To my knowledge, our only customer was Special Forces and the CIA, I guess. Baker: Special Forces meaning Special Forces of the Army? Senseney: The FBI never used anything. Baker: Looking at your previous executive session testimony, apparently you developed for them a fountain pen. What did the fountain pen do? Baker: Could it fire a dart or an aerosol or what? Senseney: It was a dart. Baker: It fired a dart . . . a starter, were you talking about a fluorescent light starter? Senseney: That is correct. Baker: What did it do? Senseney: It put out an aerosol in the room when you put the switch on. Baker: What about a cane, a walking cane? Senseney: Yes, an M-1 projectile could be fired from a cane; also an umbrella. Baker: Also an umbrella. What about a straight pin? Senseney: We made a straight pin, out at the Branch. I did not make it, but I know it was made, and it was used by one Mr. Powers on his U-2 mission. Huddleston: Were there frequent transfers of material between Dr. Gordon's [a researcher at Fort Detrick] office and your office, either the hardware or the toxin? Senseney: The only frequent thing that changed hands was the dog projectile and its loaders 46-40. This was done maybe five or six in one quantity. And maybe six weeks to six months later, they would bring those back and ask for five or six more. They would bring them back expended, that is, they bring all of the hardware except the projectile, okay? Huddleston: Indicating that they have been used? Huddleston: But it could have been used on a human being? Senseney: There is no reason why it could not, I guess. Schweiker: Mr. Senseney, I would like to read into the record [from a CIA document] at this point a quote from paragraph nine [exhibit 6, document 67]: "When funds permit, adaptation and testing will be conducted of a new, highly effective disseminating system which has been demonstrated to be capable of introducing materials through light clothing, subcutaneously, intramuscularly, and silently, without pain." Now, I just have a little trouble, Mr. Senseney, reconciling your answers in conjunction with this project, when the CIA document makes clear that one of the very specific purposes of the funding and the operation was to find a weapon that could penetrate light clothing subcutaneously, which obviously means through the skin, and intramuscularly, which obviously means through the muscles of a person. And are you saying that you have absolutely no recollection at all that tests or programs were designed to use any of these devices to permeate clothing on people and not dogs? Senseney: We put them on mannequins. Senseney: We put clothing on mannequins to see whether we could penetrate it. These were the requirements. You almost read the exact requirements that the SDR quoted from the Special Forces there. Schweiker: I would not expect you to test them on live human beings. I would hope that you did use mannequins, Mr. Senseney. Wouldn't that be directed toward people-usage, though? That is the point we're trying to establish. Senseney: That is what the Special Forces direction was. You have to look at it this way. The Army program wanted this device. That is the only thing that was delivered to them. It was a spin-off, of course, from the M-1. The M- 1 was a lethal weapon, meant to kill a person, for the Army. It was to be used in Vietnam. It never got there, because we were not fast enough getting it into the logistics system. Schweiker: What was the most-utilized device of the ones with which you worked and supervised? Senseney: The only thing I know that was really used was the dog projectile. The other things were in the stockpiles. I don't think anyone ever requested them. Schweiker: How do you know for certain it was for dogs? Senseney: Well that is what they asked us to test them against. They wanted to see whether they could put a dog to sleep, and whether sometime later the dog would come back and be on its own and look normal. Schweiker: Of the devices that came through you, which of these were utilized in any capacity other than for testing? Senseney: That was the only one that I know of--the dog projectile. I call it a dog projectile. We were developing it because the scenario read that they wanted to be able to make entrance into an area which was patrolled by dogs, leave, the dog come back, and then no one would ever know they were in the area. So that was the reason for the dog projectile. Church: Thank you Senator Schweiker. I think it is clear that the CIA was interested in the development of a delivery system that could reach human beings, since not many dogs wear clothing. And you would agree with that, wouldn't you? Schwarz: Along the same line, I assume you must agree that spending money in order to make darts of such a character that they cannot be detected in an autopsy does not have much to do with dogs? Senseney: No, that would not have anything to do with dogs. In 1960, the CIA purchased from the Army at Fort Detrick, Maryland a poison-dart weapon system, consisting of small flechette-type projectiles, self-propelled by solid-state rocket fuel, and launched by a series of devices, including umbrellas. The flechettes were about 5mm in diameter and about an inch long. The poisons carried were of two types. One was a lethal poison, apparently used against enemies in Vietnam. The other was a quick-acting, paralyzing poison that took effect in less than two seconds and lasted for several hours. This was intended for use against dogs guarding a secured enemy area. It had to cause paralysis fast enough to prevent the dog from barking. The flechette completely dissolved in the body, leaving no trace, so that enemy agents would not be suspicious. The dogs recovered after several hours and behaved as though nothing had happened. The launching devices did not have to be very accurately aimed and fired, because the weapon was designed for close range. The flechette could hit any part of the body of a dog or human and still cause complete paralysis. The solid-state fuel was ignited by completing an electrical circuit. The umbrella used a battery-powered circuit. The battery and trigger button were located in the handle of the umbrella. Wires running up the shaft connected the button and battery to the igniter, which was mounted on the shaft. The trigger button activated the igniter, firing the solid propellant, which sent the flechette through the rocket launcher--a straw-sized metal tube--to its target. WHAT HAPPENED IN DEALEY PLAZA? Here is the way the assassination team used the weapon system to kill JFK. TUM took aim by sighting along the launcher and tracking JFK as he moved down Elm Street. He continued to track JFK after firing the flechette at Z189. He quickly raised and lowered the umbrella after firing. This motion may have been caused by operating a reloading mechanism in the umbrella to put a second flechette into the firing position. It could also have been a signal to a radioman accomplice to transmit a beep, calling for a second volley of shots (see next section). The flechette struck JFK in the throat at Z189, entering above his collar, creating a 4mm entry wound and causing immediate paralysis. The trajectory can be seen from photo #13 to have cleared the edge of the limousine. The flechette was traveling at an angle from the right front of the limousine, and it missed the other occupants of the car. The paralysis took place in about one and a half seconds, from Z189 to Z216. By Z224 (see photo #4), JFK's arms, fists, head, and shoulders had been in a paralyzed state for a half-second. The flechette made no noise when launched, so that no one heard a shot at the time of Z189. The flechette's momentum was small because it was extremely lightweight. As a result, only a small transfer of momentum occurred, driving JFK's head only slightly upward and backward. This can be detected by a careful comparison of photos #1 and 2, Z189 and Z190. JFK's right hand can be seen to remain in a fixed position between these two frames (1/18 second) with respect to the side of the car. His head moves up and back in comparison to his hand or the car. The first rifle shot was fired from the second floor of the Dal Tex building. It struck JFK in the back, five and three-quarters inches below his shirt-collar line, at frame Z225. Since JFK's muscles were paralyzed, he was like a rigid, sitting duck target. His head and upper torso were driven down and forward, and his elbows were flung upward and outward, because no muscles would stop a rotating elbow and arm motion pivoting around two frozen points- -his fists and his shoulders. (Observe all of these points between photos #5 and 6, Z225 and Z227--2/18 seconds apart.) If JFK had been in a nonparalyzed state, the back shot would have knocked him much farther forward and down. The flechette dissolved in JFK's body, leaving no trace, except for the small entrance wound in his neck. The poison would not have shown up in the autopsy, even if tests for it had been made. However, because there was no apparent reason to suspect poison, no tests for it were made. After Jim Hicks made his statement to Jim Garrison's investigators in 1968 about being a radio coordinator for the firing team, researchers were convinced that radio communications were used between radiomen located near each of the riflemen and some central coordinating transmitter. Hicks appears at the center of the plaza on the south side of Elm Street, near Houston Street. In the Zapruder film, he is seen during the shooting with both hands showing, no radio transmitter visible, and no other indication that he is doing anything but observing at the time of the shots (photos #1, 2, and 3). Hicks' real role was as the radio system supplier and tester. Later Hicks shows up with the radio in his back pocket, walking down Elm Street (see photo #18, taken by Willis). In 1977, Cutler, Sprague, and Sharrett discovered the real radio coordinator in a series of photos. In photo #13 he appears with raised hand, standing to the left of the Stemmons Freeway sign, on the north curb of Elm Street. He is about twenty feet away from TUM. Because his identity is unknown, he will be called TA (The Accomplice) in this article. His raised hand appears in photos #4, 5, and 6. Early observations of his hand concluded he was waving at the President. Closer analysis shows he was not waving. His hand remains raised and motionless, except for a slight clenching. TA can be seen sitting next to TUM in photo #14 and walking away down Elm Street in photos #15 and 16. The radio can be seen in photo #19, taken by Jim Towner, in TA's belt at the back, and also in photos #14 and 15. TA undoubtedly was using a button-type beeper transmission technique for signaling all radiomen to have the riflemen shoot in volleys. The button was in his raised hand. A wire connection to the battery-powered transmitter was mounted on his belt at the back. The first beep was transmitted as soon as TUM launched the flechette. The second beep was transmitted a second or two ahead of Z312. The first signal triggered rifle shots from the shooter in the Dal Tex building and the shooter on the west end of the sixth floor of the TSBD (Texas School Book Depository). The man on the knoll did not have a clear shot at that time and did not fire. The Dal Tex shot hit JFK in the back at Z225, and the TSBD shot hit Connally at Z237. Three shots were fired in the second volley--by the Dal Tex rifleman, whose bullet narrowly missed JFK and hit the south curb of Main Street; by the TSBD rifleman, whose shot struck JFK in the head at Z312; and the man behind the fence on the grassy knoll, who now had a clear path and fired the fatal shot. His bullet struck JFK in the right temple and exploded at Z313. The fourth rifleman was positioned right by the octagonal structure at the west end of the semi-circular wall on the grassy knoll north. He did not shoot, because the Stemmons Freeway sign and a tree were in his way. He had a clear shot after the limousine had passed the sign, but by then JFK was dead. He would have fired had the others missed their target. 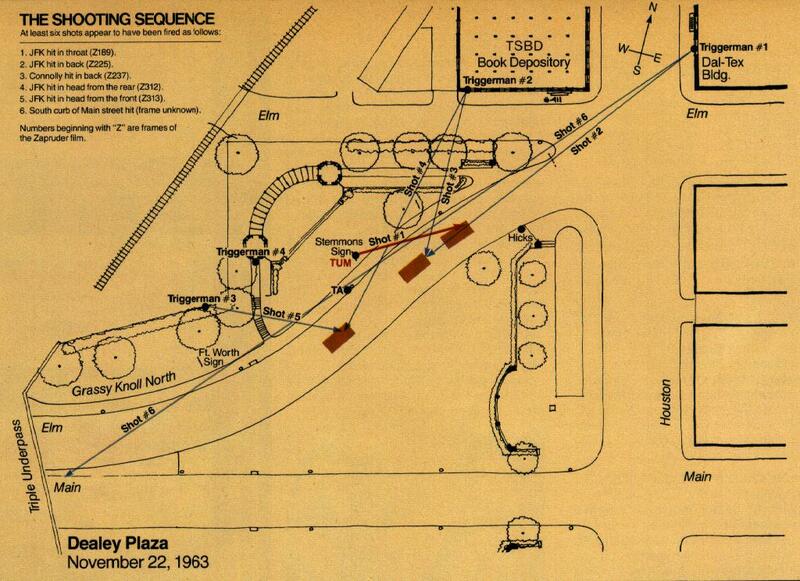 TA and TUM got together, for about two minutes, immediately after the shots, probably to discuss the results and to observe any police or Secret Service activity in the area (see photo #14). Then they went in separate directions, up and down Elm Street (see photos #15 and 16). locations indicated on diagram above"
The President's small throat wound was caused by a small flechette. TUM's flechette was actually moving in a slightly upward trajectory, explaining the backward and upward motion of JFK's head between Z189 and Z190. The flechette's small momentum explains why there was no violent backward motion. JFK's fists clenched and his head snapped to face forward while his right hand snapped downward because his muscles were paralyzed quickly by the poison. The bullet at Z225 didn't knock JFK down, because he was paralyzed. The paralysis affected the muscles, fixing them in position and preventing those portions of JFK's upper body from moving when he was hit in the back. His elbows were not fixed and were flung outward. TA was the radio coordinator and was standing behind TUM, where he could see TUM's signal and transmit a beep to the radiomen, ordering the first volley. FIRST: Some higher-level individuals within the CIA furnished one of their secret weapons systems to be used in the assassination. It is doubtful that more than a very few umbrella launchers were made for the CIA at Fort Detrick. This may have been the principal reason for the CIA cover-up that began on November 22, 1963. SECOND: The degree of sophistication in such a complex intelligence murder--including the planning for the paralysis, the radio coordination, the firing positions creating a cross fire in two volleys, gaining access to the buildings, setting up a patsy (Oswald), and all of the other techniques used-- indicate that lower-level anti-Castro Cubans, or even Mafia members, could not have pulled it off without CIA guidance and supervision. Skill and intelligence training, plus detailed management, were required from the only organization capable of running such an operation. THIRD: The Select Committee on Assassinations and the Senate Intelligence Committee have a lot more interrogating to do. They must question the people who designed the weapon system and those who made it available to the assassination team. Richard E. Sprague is currently a consultant to the Battelle Institute, a think tank in Columbus, Ohio, and was formerly a consultant to the House Select Committee on Assassinations. He has written numerous books and articles, including the self-published The Taking of America 1-2-3.